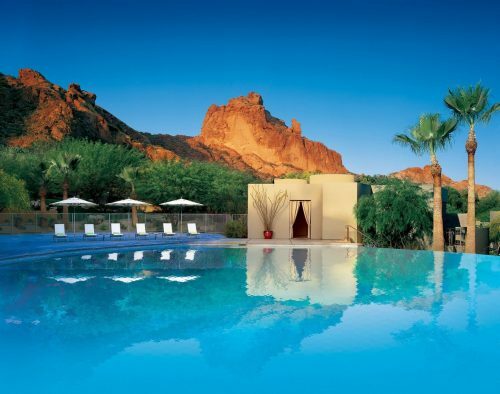 Even though I didn’t arrive at Sanctuary on Camelback Mountain Resort & Spa as a bride, a honeymooner, or even a bachelorette, my time at this Arizona resort is best described as the perfect marriage of relaxation and romance. Like many before me, I was immediately enchanted by the organic and natural landscaping that lined the expansive property, I was quickly wooed by the staff’s attentive and genuinely friendly service, and I was deliciously charmed by celebrity chef Beau MacMillan’s culinary creations at Elements restaurant. But in the end it was the simple pleasure of watching the desert sun set slowly beneath the mountainous skyline that ultimately won me over as I sat, basking in the warm night air from the comfort of my private patio, able to fully understand why this desert oasis had become such a coveted backdrop for truly magical weddings. 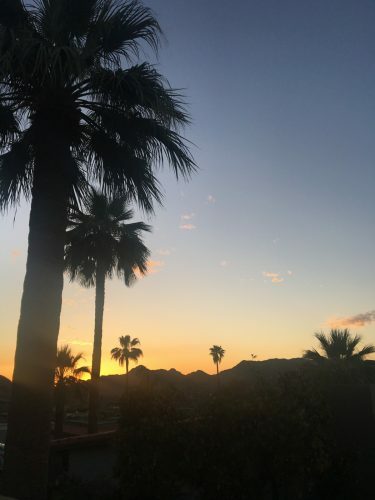 Set at the base of the iconic Camelback Mountain, within the aptly named Phoenix suburb of Paradise Valley, the atmosphere surrounding Sanctuary is one of relaxed elegance and blissful simplicity. 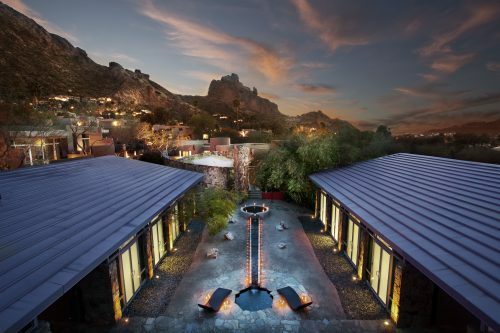 The resort’s minimalist design and effortless approach to luxury have attracted A-list celebrities like Beyoncé and Jay-Z to this southwestern spa-resort for romantic weekends away. The Carter’s, along with so many other couples throughout the resort’s decade’s long existence, chose Sanctuary as the site of their honeymoon to relax and unwind as newlyweds, still giddy with the excitement of just saying their vows. The resort is famous as a respite for relaxation—home to one of the highest rated spas in the world, where a number of wellness and spa packages await couples looking to kick back in the desert after their weddings—but the resort’s recent complimentary wellness experience now gives the gift of relaxation to brides prior to walking down the aisle. Starting now and lasting through 2019, all resort weddings will include Bridal Balance, a complimentary two-hour wellness experience to help Sanctuary brides refocus and unwind before their big day. The days leading up to the wedding are often fraught with emotional stress, tedious details, and last-minute problem solving, which is why the resort decided to give their brides a much needed break. Brides have the option of selecting any two experiences from the Sanctuary Spa menu, whether it is a massage or body treatment (follow our Do’s and Don’ts for Wedding Day Spa Treatments), a personal training session, a guided meditation, or even a tarot card reading. The experience can be scheduled around wedding day activities, and, as always,brides are invited to retreat to Sanctuary Spa’s new Quiet Room after their treatmentsand enjoy any of the Spa’s world class amenities, including the Vitality pools, steam baths, and a 25-yard outdoor lap pool.